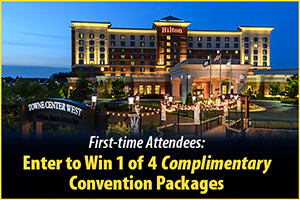 Hit the Road to Success With a Free Convention Package! Networking and learning about industry issues at the annual VMLA convention is a great way to ride the road to success — and winning a free convention package could be another milestone for new attendees. That’s why VMLA partner sponsor VHDA is giving away complimentary VMLA convention registration, plus hotel room for the night of Sept. 21, to four first-time attendees. One winner each will be selected by random drawing from the Central, Western, Hampton Roads and Northern Virginia regions. To enter for your chance to win, go to vhda.com/VMLA, fill in the entry form and submit it by 5 p.m. ET on Monday, Aug. 21, 2017. If you’re a winner, you’ll be notified by 5 p.m. ET on Monday, Aug. 28, 2017. No purchase is necessary to enter or win. The Governor's Housing Conference connects Virginia's affordable housing providers with funders, lenders, realtors, nonprofits, public officials and resources to improve housing in Virginia's communities. The conference provides stimulating and thought-provoking information and educational sessions led by experts in housing, finance and development. Each year more than 800 people from throughout Virginia participate in the Governor's Housing Conference to take advantage of excellent professional development, incredible networking and valuable training opportunities. It is Virginia's largest and most comprehensive affordable housing event of the year. Scholarships cover the cost of the conference registration only. Applications will be ranked based on financial need and statement of interest. Applicants who have not received a scholarship in the past will be given priority. Applications should be completed, signed, scanned and emailed kendall.cloeter@dhcd.virginia.gov. Apply by 11:59 p.m. on Friday, Sept. 8, 2017.